90% of information is transmitted in the human brain is visual, and people process visuals 60,000 times faster than text. Video and video conferencing is fastly becoming the new must-have business tool for generating profits and successfully growing your business. In fact, over the past four years, the percentage of companies utilizing video conferencing has jumped from 41% to 58%. 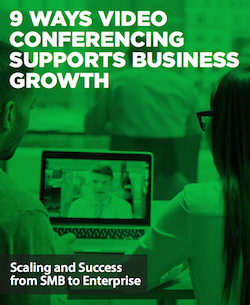 Download and read our guide 9 Ways Video Conferencing Supports Business Growth to gain an understanding of how you can use this fast-growing tool to drive powerful improvements within your company.